Dr Richard Russell, MD FRS, was born in 1687. In 1750 he published a paper entitled ‘Glandular Diseases, or a Dissertation on the Use of Sea Water in the Affections of the Glands’. This paper prescribed the sea water cure and Russell advised his patients to swim in and also to drink, sea water. 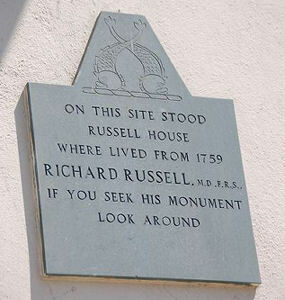 Russell lived in Lewes but he recommended that his patients try the nearest place to bathe and take the sea water cure. That place was of course Brighton, and so the town saw a massive influx of visitors. 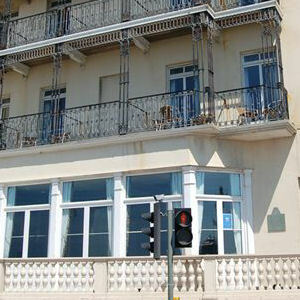 Wealthy Londoners thronged to Brighton and the modern seaside resort was born. Dr Russell and his sea water cure became so famous that he decided to move from Lewes to Brighton. He built a very large house on the site of what is now the Royal Albion Hotel. Richard Russell died in 1759. The plaque on the wall of the Royal Albion Hotel says simply: “If you seek his monument, look around”. Do you have any more information about Dr. Richard Russell? Have found an article on Dr Russell on medical site: http://www.pubmedcentral.nih.gov/articlerender.fcgi?artid=1645547. Am interested in Brighton’s development in this era, if you have any pointers, let me know. I want to know more about the Doctor Richard Russell. Dr.Richard Russel changed brighton – Brithelmston – I wish to know if he made anymore cures for anything else? I have a first edition of his classic Seawater cure book – it is a wonderful and graphic read. If you go to Brighton library they can direct you to a copy to have a read. I believe my 3 x great grandmother, Jane Denman, (a 30 year old married servant girl) was working at this spa. She is on the 1841 Census working in the “Old Steine”, at what must have been this spa before the Royal Albion was built. She is on this census alongside other male and female servants; with people boarding there, and with medically qualified people. (ie physicians and surgeon/dentists!). This was after Dr. Russell’s time, but the clinic must have survived him.